Best Chinese Knives: A blast from the past - Back in stock fan-favorite clones (Carrillo, Microtech, Hinderer, Umnumzaan, ZT, Cannabis)! A blast from the past - Back in stock fan-favorite clones (Carrillo, Microtech, Hinderer, Umnumzaan, ZT, Cannabis)! All time favorite clone are now back in stock! 1. The Wild Boar XM-18 Full Ti Clone - Another batch of knives from the Wild Boar factory. It has the full ti handle with an Enzo pattern and acid stone-wash finish. It also sports the steel insert on the frame for better lockup. Hinderer Eklipse Style (0392) clone is also available here. Check out the genuine Hinderer Knives here. 2. Dwayne Carrillo Tunnel Ratt Clone: Budget offering of the awesome Carrillo design. 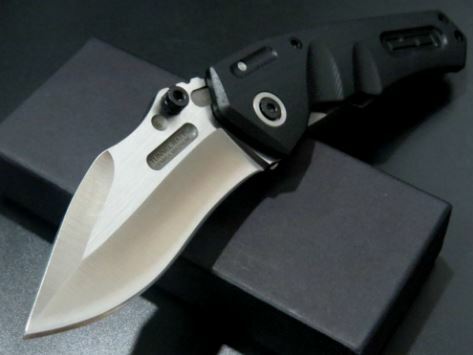 This beefy folder has a 6mm thick blade and a general overbuilt construction. A real hard use blade for a pretty low price. Has G10/Steel handle with a framelock. 3. Shiro Cannabis Clone - Great Sinkevich designed blade. Ti linerlock and G10 handle + bearings in the pivot made it a favorite among Chinese knife appreciators. - Chris Reeve Umnumzaan Clone - Another must have to try with ti handle and D2 blade. - Microtech Whaleshark Clone - The original is sold out pretty much everywhere, but the clones are in stock.